30" Conical Parachute with the spill hole. Highest quality, professionally made, multipanel, 15 degree conical design, rip-stop nylon construction, 6 shroud lines. 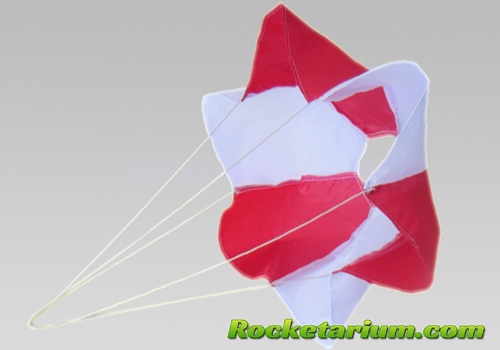 PML chutes are made by a real parachute company, are not just "hobby parachutes". All are multi-panel chutes, not a flat disc with shroud lines. All are a 15-degree conical design. All sizes use 1.9 ounce rip-stop nylon coated with urethane for zero porosity. Actual weight of the fabric is 2.6 ounces/sq. yard. The lines are braided polyester with a breaking strength of 180 pounds minimum.